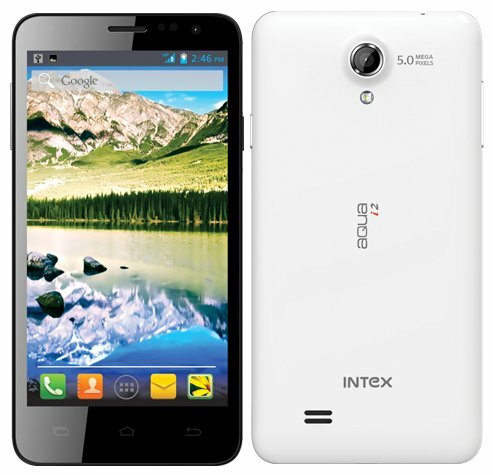 Intex mobiles has officially introduced yet another budget android smartphone, the Intex Aqua i2. The new Aqua i-2 has FWVGA display, Android 4.2.2 Jelly bean OS and 1.2 GHz dual core CPU. It will compete / VS with Micromax A77 Juice, Spice Mi 436, Karbonn A8 and Gionee Pioneer P3. It packs with a 5megapixel shooter and 2megapixel front facer. Aqua i2 is a dual Sim handset andit houses 1700mAh battery. It offers standard connectivity options like 3 G, WiFi b/g/n, BT, aGPS and FM radio. The Intex Aqua i2 would be priced under Rs 10000, however the exact price of the phone is not announced yet. It comes in White, Green and Black colors. Intex would launch it by the end of this month. It is currently listed on company’s official website.